The Wallabies and Springboks have battled out a bruising 14-all draw in the Tri-Nations clash at Perth's Subiaco Oval. 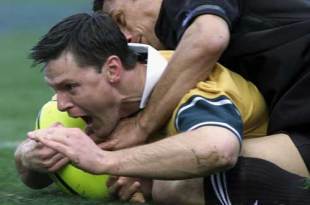 Wallaby five-eighth Stephen Larkham attempted a repeat of his World Cup heroics with a last-gasp, 40m field-goal, but the kick was pushed to the right. The 42,658-strong crowd was left exhausted after watching easily the toughest Test the Wallabies had played this year. The draw means the Wallabies retained their lead on the Tri-Nations table with seven points, ahead of the Springboks on six and the All Blacks on four. The Springboks travel to Auckland to meet the All Blacks on Saturday. But with such a close table, the Tri-Nations champions will not be known until the result of the final game between the Wallabies and All Blacks at Stadium Australia on September 1. Both sides scored one try and landed three penalty goals in 80 minutes of enthralling rugby that was dominated by an unforgiving Springbok defence. The Springboks played one man down for 20 minutes during the second-half with five-eighth Butch James and captain Bob Skinstad spending time in the sin-bin. The Springboks held an 8-3 lead at half-time after veteran lock Mark Andrews crossed for a try just before the break. Replays showed that Andrews' foot went into touch as he dived over in the tackle, but the result was perhaps deserved after the Springboks outthought and outplayed the Wallabies in the 20 minutes before half-time. In a spirited performance, the Springboks contested every skerrick of possession and bustled the Wallabies into errors at their own lineouts and scrum. The Wallabies lost three of their lineout throws during the opening 40 minutes, were dominated at the scrum and were generally rattled in attack with an uncharacteristic 15 turnovers. The Wallabies made a blazing start to dominate the opening 20 minutes with Larkham kicking often to turn the Springboks. But for all their dominance, the Wallabies could manage just the one penalty to Matt Burke in the seventh minute. Springbok inside-centre Braam van Straaten equalised in the 21st minute and it sparked his side who proceeded to dominate the remainder of the half culminating in Andrews' try in the right corner. As in the first-half, the Wallabies dominated early after break, but the Springbok defence answered every Wallaby challenge. Burke had a chance to reduce the lead to just two points in the 42nd minute with a penalty kick, but missed the simple attempt from in front of the posts. The game took a turn in the 54th minute when James was sin-binned for 10 minutes after his third warning for not using his arms in the tackle. James' defence was solid throughout, with one memorable hit on Wallaby inside-centre Nathan Grey early in the second-half. There was a steady procession of replacements from both sides as the bruising pace of the game took its toll. The Wallabies maintained all the momentum, but even with the one-man advantage could make no impression on the score before James returned to the field. But as the hard-hitting Springbok ran back on, the Springboks were dealt another blow when Skinstad was sin-binned for consistent infringements at the breakdown. Burke landed a penalty to reduce the lead to 8-6 in the 67th minute, but van Straaten replied almost immediately after Wallaby prop Nick Stiles was penalised at the restart. The game was set for an epic finish when Grey finally achieved what seemed to be the impossible when he finished off an impressive passage of play for the Wallabies to score in the 71st minute. Burke missed another relatively easy kick and with eight minutes remaining the scores were level at 11-all. Van Straaten and Burke traded penalty goals in a frenetic final six minutes before Larkham had a final shot seconds before full-time. First Half: 3-0 Burke penalty (9th minute); 3-3 Van Straaten penalty (22nd); 3-8 Andrews try (40th). Second Half: 6-8 Burke penalty (27th); 6-11 Van Straaten penalty (30th); 11-11 Grey try (72nd); 11-14 Van Straaten penalty (76th); 14-14 Burke penalty (79th). Wallabies: Matthew Burke, Chris Latham, Daniel Herbert, Nathan Grey, Joe Roff, Stephen Larkham, George Gregan, Toutai Kefu, George Smith, Owen Finegan, John Eales (capt), Justin Harrison, Rod Moore, Michael Foley, Nick Stiles. Substitutes: Brendan Cannon, Ben Darwin (Moore 60th), Matt Cockbain (Harrison 62nd), Phil Waugh (Smith 58th), Chris Whitaker, Elton Flatley, Graeme Bond (Latham 65th). Springboks: Conrad Jantjes, Breyton Paulse, Robbie Fleck, Braam van Straaten, Dean Hall, Butch James, Joost van der Westhuizen, Bob Skinstad (capt), Andre Venter, Andre Vos, Mark Andrews, Victor Matfield, Cobus Visagie, Lukas van Biljon, Robbie Kempson. Substitutes: John Smit (Van Biljon 65th), Ollie le Roux (Kempson 60th), Albert van den Berg (Andrews 60th), Corne Krige, Neil de Kock, Deon Kayser (Fleck 20th), Thinus Delport.